I updated and checked my excel spreadsheet and everything looks okay in there. 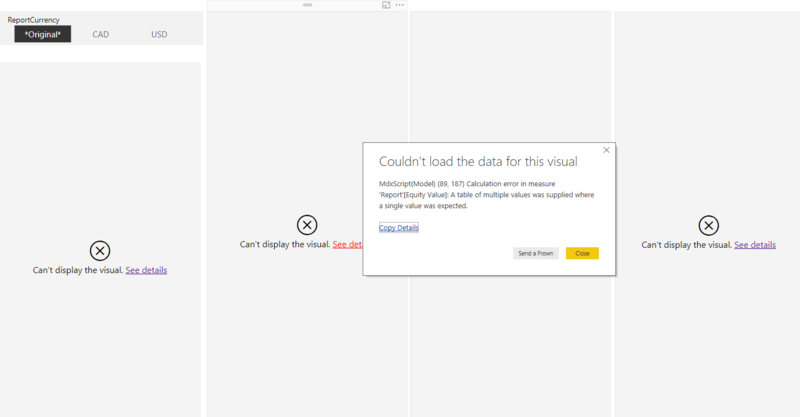 I recreated my Power BI file and that did not fix it. Not sure what changed or what I did. Note: This is still v2.3.0 of the PS spreadsheet and the v2.3 Power BI template. It is very likely that in Quotes.csv file you have quotes for symbols that are not defined in Excel Symbol table, Please add these symbol definitions to Excel Symbol table and then you should have no problems. Ah, okay, that probably explains it... last night I set up a second PS spreadsheet to track my TFSA (I wanted to keep it separate from my RRSP accounts). I updated my psconfig.txt file to contain the symbols in my TFSA, but those symbols are not in my RRSP spreadsheet. So if I want to use Power BI and I want to have two separate spreadsheets, then I need to make sure all the symbols are in both spreadsheets regardless if I buy them in that account or not, correct? And yes, adding my TFSA symbols to my RRSP spreadsheet fixed it. Thanks!